Financial troubles are difficult for every member of your family – including your dog. In fact, if you really get painted into a financial corner, you may have trouble affording your pet’s food. Fortunately, many non-profit groups and other organizations have programs designed to help owners in exactly these types of circumstances. Most of these resources are administered on a local level, so the specifics vary from one location to the next. You may need to do a little digging to discover what’s available in your area. But, we’ll direct you towards some of the best places to start below. We’ll also explain a few other ways for low-income families to obtain other pet supplies and services for little or no money. Pet shelters often struggle to keep the animals under their care fed, but some of the most successful ones receive enough funding to provide food to needy families too. Some even establish pet-food banks! Use this ASPCA resource to find shelters in your area. Non-profit organizations come in a variety of flavors – they aren’t all shelters. Many non-profits have programs designed to help feed dogs that live with low-income families. For example, the Humane Society of the United States (related to, but different from, your local Humane Society Shelter) maintains a list of resources available to low-income dog and cat owners. Some vets – particularly those in rural or impoverished areas – participate in charitable programs that provide free or low-cost dog food to families in need. Many will also provide reduced fees for spaying/neutering, vaccinations, and other services. Once again, the HSUS is here to help you find low-cost veterinary services. Many breed advocacy groups and clubs provide assistance to low-income families. You’ll have to search for organizations that focus on your dog’s breed, but this AKC Parent Club List will make it easy to get started. Also make sure to find breed advocacy groups online (even Facebook groups), as you may find locals who would gladly assist a fellow owner, even if that means shipping over food from another part of the country. Your local pet store may be willing to cut you a deal on your dog food bill if you explain your circumstances. Others may even be willing to let you barter services in exchange for dog food. Churches, synagogues, mosques, and other religious institutions often provide assistance to low-income families, and this may include donating dog food. You’re most likely to obtain assistance from your own religious institution, but many are willing to help anyone in need, regardless of religious affiliation. Some manufacturers offer free samples – you simply need to write or call them and make a request. 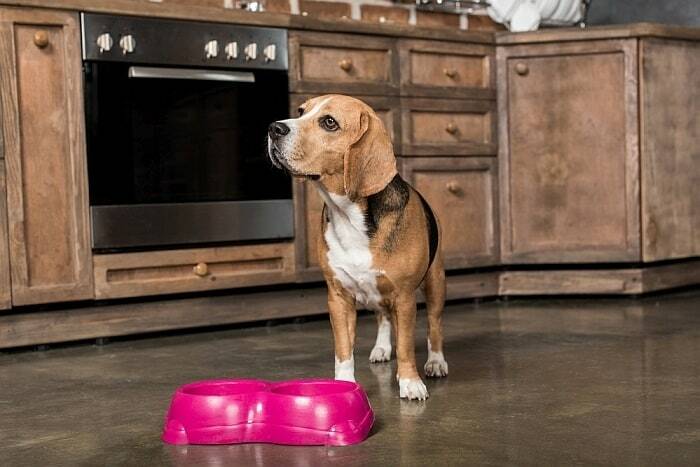 You won’t be able to feed your dog over the long-term with free samples, and you don’t want to be constantly changing your dog’s food (this can cause intestinal issues), but a few free trial-size bags of dog food in your cupboard may help out in a pinch. Food isn’t the only thing your dog needs. He’ll also need a bed, collar, leash, some toys, and other items. Fortunately, there are a few avenues by which you can often find low-cost or free versions of these supplies. Your vet may be willing to provide services at reduced fees. Most vets go into the field of animal care because they love animals. This means that they’ll often be willing to work with you to ensure you can afford the care your pet needs. They may be willing to reduce the fees associated with various services, do small things (like nail trimming and tooth brushing) for free, or allow you to pay for services over time. Local pet stores – especially those of the mom-and-pop variety – may be willing to give discounts to people having trouble affording their pet’s needs. They may also be able to give you a heads up regarding upcoming sales, clearance events, or similar promotions. Social media networks often give you the chance to speak with other dog owners and find unique opportunities. You can search for mentions of free dog supplies or send out a message or request to your friends and acquaintances. This is often a great way to acquire second-hand beds, crates, and similar items. As with foods, some manufacturers will provide free samples – often in exchange for a review on Amazon, Yelp, or some other website. Don’t get too excited; manufacturers aren’t going to line up to send you a free crate or dog bed, but some may provide low-cost items (such as ID tags, collars, supplements, or grooming products) in exchange for your honest feedback about the product. It can be difficult to contact aid organizations or shelters to ask for help. Many people are embarrassed to ask for assistance and fear being judged. This leads many people to procrastinate – often at their pet’s expense. But don’t worry: It’s rarely as bad as you think it will be. First of all, relatively few people decide to work in a non-profit or low-income assistance organization to dole out judgment; they go into such work because they love animals and want to help. They are typically warm, compassionate, and empathetic, and they’ll be happy to help in any way they can. Additionally, the employees and staff at most non-profits and aid organizations have been trained to assist people in tough situations. They’ve assisted other owners in similar circumstances before and are taught techniques to help people without making them feel bad about their circumstances. It’s usually best to rip off the Band-Aid quickly. So, go ahead and pick up the phone or visit one of these organizations in person. Chances are they’ll quickly put you at ease and, before you know it, they’ll be helping you obtain food for your dog. Some people may feel better sending an email rather than speaking directly with the staff. That’s usually perfectly acceptable, and it may even be an easier method of communication for the staff. Don’t feel like you need to explain your life story in the first email – you simply need to make the connection and start the ball rolling. Hello. My name is ____________ and my family is currently experiencing some financial difficulties. We are doing everything we can to rectify the situation, but we are having trouble keeping our beloved family pet well-fed. We were hoping that your organization may provide some type of assistance to families in situations like ours, or that you may be able to let us know about other local organizations that do. We love our pet dearly and regret that we need to ask for help. We’d thoroughly appreciate any assistance you can provide.